At face value, this may seem like just another shallow idea with a typical love story. But this is far from it. It’s an incredible story that has a very serious undertone, indeed. It is actually documenting the effects of the start of the financial downfall that we are now experiencing globally. The movie is not told from the perspective of an employee being let go and the inevitable family and financial problems that would accompany it, but from the point of view of the man that is hired by the boss to tell their employers they no longer have a job. This is a song that a man named Kevin Renick wrote after losing his job. He sent it to Jason Reitman after hearing about the film and the song is played on the credits. Shows how real this film is, I think. It’s a fantastic – yet heartbreaking – perspective, because we also see how technology is ruining human connection. For example, it is proposed that instead of Ryan Bingham (George Clooney) flying from city to city letting these people go face to face, that he could actually tell them online via a camera which would be more ‘efficient’, but obviously much less personal. This proposition doesn’t work for Bingham whatsoever. Let alone the people getting told they’re losing a job. It’s a sad story of how people’s worlds collapse, how in many respects the odds are against us and that people can no longer rely on each other since it is predominately all about profit. It addresses how we have stopped being personal, only professional, and how a job can become somebody’s life. How it can be their only reliable thing. Of course, being the director of Juno, Jason Reitman has created another fantastic comedy with very quirky lines. I love this kind of humour, particularly in the scene showed in the photo above. Ryan: I’m not a shrink, Bob. I’m a wake-up call. You know why kids love athletes? 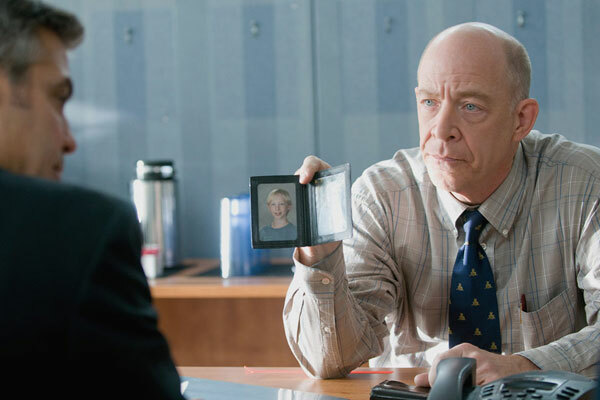 Bob (JK Simmons): I don’t know. Cause they screw lingerie models? Ryan: No, that’s why we love athletes. Kids love athletes because they follow their dreams… Your resume` says that you minored in French culinary arts. Most students, they work on the fryer at KFC, but you bussed tables at Il Picador to support yourself. Then you get out of college and then you come and you work here. How much did they first pay you to give up on your dreams? Bob: 27 grand a year. Ryan: And when were you going to stop and come back and do what makes you happy? This fantastic film is pretty much about all the different ways somebody can feel ‘up in the air’ with little substance and solidarity in their life. It is a sad film if you look beyond its face value, with not much of a happy ending which I think is very appropriate since we are not quite out of the dark yet. However, it’s strong, underlying current of humour keeps us afloat and captured throughout the whole film. Gallery | This entry was posted in All Film Reviews, Date Night Movies, drama, Editor's Pick, Girls' Night Movies, Travel Movies and tagged 2009, anna kendrick, film, film review, george clooney, jason reitman, jk simmons, juno, kevin renick, movie, nz, review, up in the air. Bookmark the permalink. Up in the air is a must see for anyone who’s been ‘let go’. As one door closes, another one opens. Only not always at the same time. You have to stay strong during that gap in the middle. Great film though, good review. You do chose the best films to review. Wonder how the Hollywood awards will go tonight.